How do I know if I am applying the recommended coverage of SPANTEX? Be sure to follow all instructions on our e-brochure or in-store brochure. All quantity application guides for square footage are included. A good rule of thumb for STEP 2 – ROLL-TEX is to pour a dinner plate size of recently stirred product onto the deck surface and spread with the wet Texture Coat Applicator. Be sure not to spread it further than it wants to go. Float the wet applicator over the surface. You should get 1 8’x 4′ piece of plywood coated per gallon of product. NOTE: Do not put the product on thicker than this ratio as it will not dry correctly and may crack. Can I use previously used plywood? Yes and no. If the plywood has old paint on it or a residue of paint on it you may have to do a test patch area to see if SPANTEX is compatible. It is always best to begin with new 3/4″ or 5/8″ plywood but if it is weathered plywood it will need to be sanded down well (no checking, cracking, or rot). The plywood must be dry and swept clean prior to begninning. I don't have Tongue & Groove plywood, can I use regular plywood? Yes, but you will need to leave 1/16th of an inch of space for expansion and contraction and will need to block the underside. Can I use a roller instead of the Texture Coat Applicator? We do not recommend a roller to spread the ROLL-TEX. The Texture Coat Applicator should be used. Using a regular roller will not correctly spread the product. The texture get caught up in the fuxx of the roller. If you must use a roller, the only other roller we recommend is a Phenolic Roller (hairless paint roller) however, is more difficult to acquire and can prove to be more difficult to use without prior experience. Can I use some filler I already have instead of SPANTEX FILL-TEX? No, the only compatible product for SPANTEX is FILL-TEX. I have the original, solvent based SPANTEX on my deck. Can I go over it with the new water-based SPANTEX? Yes, for a maintenance coat, the STEP 3 – COLOR-COAT is required. If it has been many years since your last coat, a coat of STEP 1 – PRIME-IT should be applied before STEP 3 – COLOR-COAT to ensure proper adhesion. Note: Always make sure your deck surface is clean and follow the maintenance guide of the brochure for application instructions.If a repair is needed and you need assistance, please call our technical department for assistance. 1-800-943-8226. I want a thicker coat. Can I apply more product than what is recommended? Yes, but the only way to do a thicker coat is to follow all quality per square foot instructions, wait until that step is completely dry and then apply another coat. IE: STEP – 2 ROLL-TEX or STEP – 3 COLOR COAT. Be aware that making an extra thick coat by doing one application can cause cracking on the deck surface, so do multiple coats and not one thick application. Can I store extra SPANTEX for future use? Yes, but depending on which step. STEP 2 – ROLL-TEX cannot be stored. Once the Dry Texture is mixed with the liquids the Coating must be used or discarded. 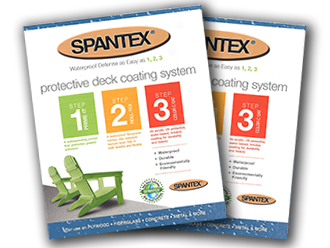 STEP 1 – PRIME-IT, STEP 3 – COLOR-COAT, and STEP J – FILL-TEX can be safely stored for up to 1 year (See our Catalog for more information). Note: Only the 1 Gallon containers can be resealed effectively. Any larger containers must be repackaged for storage as they do not reseal once opened. Note: SPANTEX is Water-based and should be stored in a cool dry area. DO NOT FREEZE.